Take part in one of SMU’s oldest traditions at the University’s 102nd Opening Convocation at 5:30 p.m. Sunday, Aug. 21 in McFarlin Auditorium. Provost and Vice President for Academic Affairs Steven Currall will give the address. Participating faculty members must assemble in academic regalia no later than 5 p.m. in the Perkins Administration Building. Faculty marshals will greet you and lead the faculty procession. The ceremony will be preceded by the Rotunda Passage, a processional march through Dallas Hall for the incoming Class of 2020. The festivities will be broadcast live by streaming video at smu.edu/live. Streaming is scheduled to begin at 4:30 p.m.
For more information, visit the Registrar’s site at smu.edu/convocation. 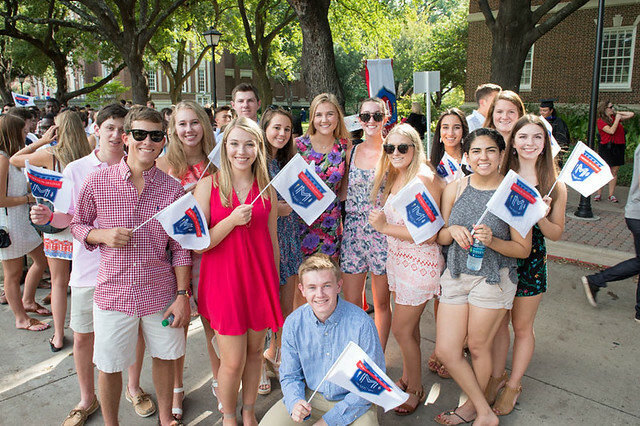 SMU welcomed 1,478 new students to the class of 2014 in August. The students come from 44 states and 36 countries, including China, India, Russia and Spain. Take part in one of SMU’s oldest traditions at the University’s 93rd Opening Convocation at 5 p.m. Aug. 22 in McFarlin Auditorium. Provost and Vice President for Academic Affairs Paul Ludden will give the address. The ceremony will be preceded by a community welcome for the University’s incoming class from 4:15-4:45 p.m. Come to the Main Quad and pick up an SMU pennant to wave in welcome to the class of 2011. For more information, contact Gretchen Voight in the Office of the Registrar, 8-2037.